Disney World is large--so large that the guide books are often close to a thousand pages. So beyond the list of well known favorites (which is a long list indeed), what are some less common insider tricks worth knowing about? On our 2012 vacation, here are our 5 favorite life hacks for families. #1--Club Cool--located in Epcot near Innoventions, this is a kid's dream come true. Inside this air conditioned (!!!) store is FREE unlimited sampling of coke flavors from around the world. Our kids tried a sip from every country and then filled their cups with their favorites. A word of advice, be sure to stand near the garbage when sampling Italy--you may want to spit it out. Fortunately, that was the only must-skip drink. Our favorites included China, Israel, and Mexico. We loved this place so much, we had to come back. Where else can you drink unlimited soda for free in air conditioned bliss at an amusement park? 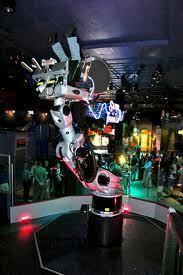 #2--Sum of All Thrills--located inside Innoventions at Epcot, you design your own roller coaster and then ride it (not to be confused with Test Track). Four claw-like robotic arms can be programmed to move in almost any direction including upside down. Each person programs their ride first choosing from various options including inversions, corkscrews, and steep hills. You also choose your speed and the simulator experience (jet, bobsled, roller coaster). My children's advice--plenty of speed and corkscrews. Then you get to ride in your creation. Because this ride is indoor, it is easy to miss and often has a short line. This is Epcot at its best--creativity meets math and science thanks to cutting edge technology. #3--Harmony Barber Shop--located at the very beginning of Main Street in the Magic Kingdom, this shop is the perfect alternative to the high priced Bippity Boppity Boutique. Baby's First Haircut is a house special and includes a certificate and mouse ears. But the real secret is in the colored gel. 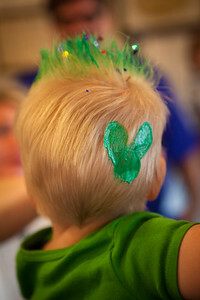 For boys, they will spike the hair in any color (or combinations of color) and add a mickey silhouette in the back. 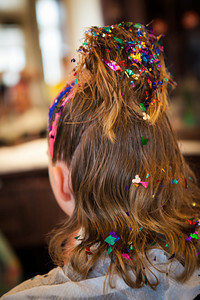 Girls can have their hair brushed into a variety of styles (pony tail, french knot, pig tails, etc.) and have their hair striped with the color gel (or combination of colored gels). And don't forget to have these hair artists use the gel to add a flower, heart, or mickey silhouette. From a punk rocker look to a princess glitter look, they can do just about anything. And all hair styles are finished with a generous sprinkle of pixie dust (you can also stop in and get a dusting of pixie magic for free). Be sure to make reservations, though walk-ins are welcome. And for only $7.50, you won't be disappointed. #4--The "hidden" playgrounds--Some playgrounds are well marked on maps and highlighted in travel guides (most notably Tom Sawyer Island at Magic Kingdom and The Boneyard at Animal Kingdom). But other, smaller playgrounds abound. At Mission: SPACE in Epcot, a space themed tube and slide area exists for little ones while older siblings enjoy the ride. Older kids and adults can also participate in a space video game played in two teams. For families enjoying ride swap (baby swap, mom swap), this is a great indoor place to play and wait. Spaceship Earth and Journey Into Imagination with Figment both end in an electronic interactive play area (our favorite was a virtual operation game). Splash Mountain (in the Magic Kingdom) also has a small area for toddlers. I regularly recommend taking a break and enjoying a playground. And though the larger play areas should be on your must-do list, these hidden playground offer a moment of escape especially for little ones that cannot go on a ride. #5--Snorkeling--offered at Typhoon Lagoon, Shark Reef allows you to actually swim in the aquarium with the help of snorkeling gear. The tank houses plenty of tropical fish and sharks! And though touching isn't allowed, you will come face to face with schools of fish. Those still working on their swimming skills can wear life jackets while kids under 5 can observe the shark tank from the portholes of a "sunken" ship. Its a touch of Disney magic in a waterpark. One of the great things about Disney is that there is unexpected magic around every turn. And what you didn't plan or wasn't on your must-do list might end up as one of your favorites.